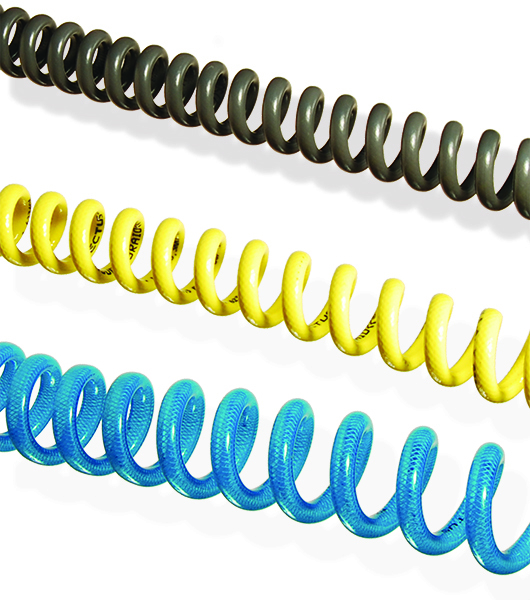 The tight diameter of our Mini-Coils make them extremely flexible and ideal for use with robotics, instrumentation, small pneumatic tools, control circuits or any other application requiring either constant or intermittent motion. They include a pigtail on each end for easy fitting installation or connection to other devices. We offer a variety of colors for coding purposes or to be aesthetically compatible with other equipment. Custom colors, sizes and lengths are available - please contact Customer Service. Mini-Coils are fabricated with precision tubing that can be used with Push-to-Connect fittings and intended for applications where motion and fatigue for non flexible connection is a concern. Supplied with "pigtails" for connection. All "tails" are 6" long on both ends. 5/32" units of lengths longer than 60" are manufactured with 1-1/8" Coil O.D. for shorter compacted length. Adding a Color Code Suffix to the part number is required. If no color is selected, Clear (0) Color will be supplied. Custom sizes, lengths and colors are available. Please consult the factory with your specifications.